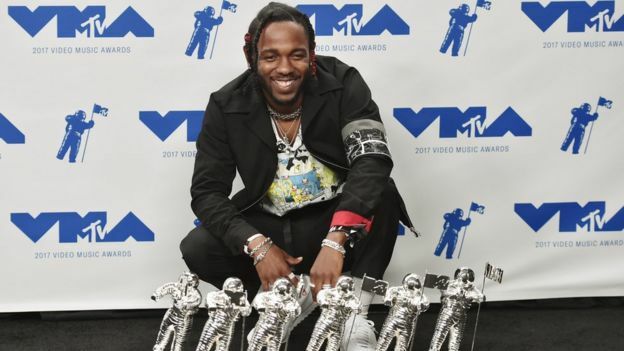 Kendrick Lamar was the night’s big winner, picking up six awards including video of the year for HUMBLE. The video, directed by Dave Meyers, takes a wry look at the rapper’s growing fame and sees him dressing up as a pope and taking part in a Last Supper. 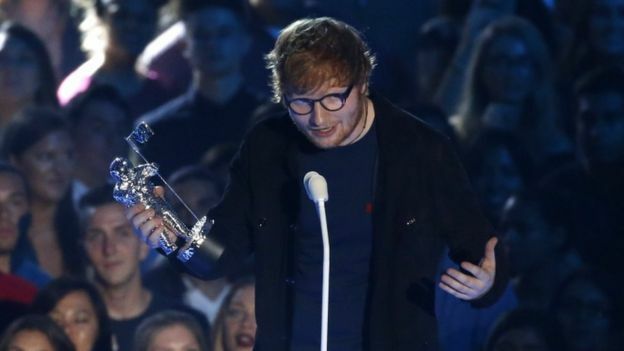 Ed Sheeran was named Artist of the Year and Fifth Harmony got the Best Pop Video award for Down. Taylor Swift was a no-show – perhaps wise given her history with awards host Katy Perry – but won best collaboration for her track with Zayn, I Don’t Wanna Live Forever. And she debuted the video for Look What You Made Me Do during the awards. But it was politics that has grabbed most of the night’s headlines. 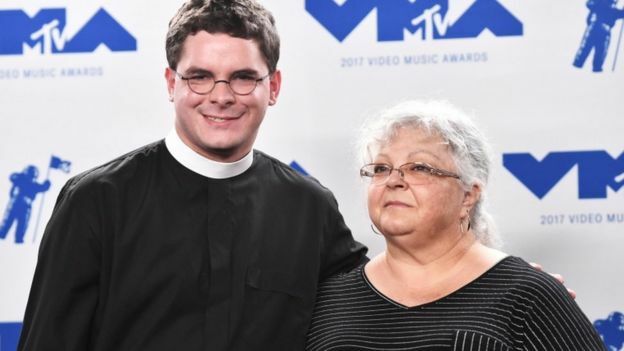 There was an appearance from the mother of Heather Heyer, killed during a protest against a far-right march in Charlottesville, Virginia. Susan Bro handed out the Fight Against the System Award, 15 days after Ms Heyer’s death. 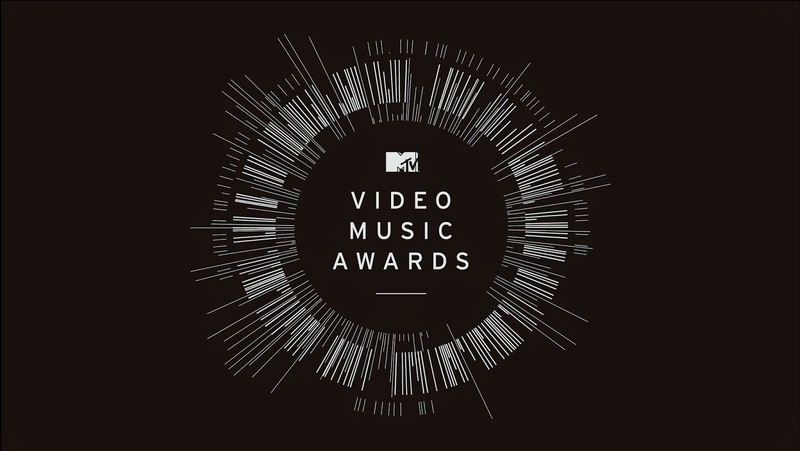 All six nominees for the award shared the prize. Somali nominee K’naan, whose cover of a Hamilton track paid tribute to the work of immigrants, wore a mock Make America Great Again slogan written in Arabic. Michael Jackson’s daughter, Paris, also spoke out against the violence in Charlottesville, calling out “Nazi white supremacist jerks”. 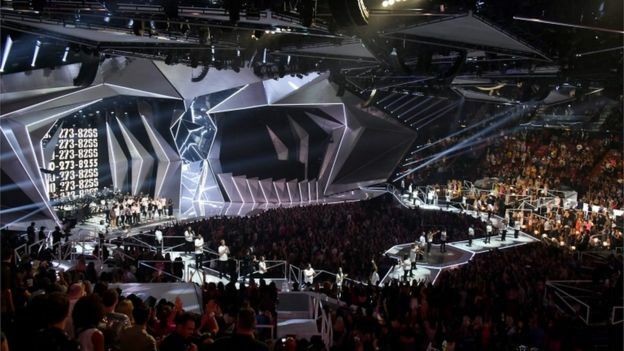 Artists mostly avoided referring to the US president directly, but criticised his policies and events. And four serving transgender service members, along with two veterans, joined stars on the red carpet at The Forum – after getting approval from The Pentagon. Thirty Seconds to Mars frontman Jared Leto paid tribute to vocalists Chester Bennington and Chris Cornell who both took their own lives earlier this year. Taylor Swift failed to appear at the event, but fans got a first look at Look What You Made Me Do – which sees a zombie Taylor in a graveyard, with a tombstone that reads “here lies Taylor Swift’s reputation”. The video has been watched more than 20 million times on Youtube already. Earlier this year, MTV announced it was abandoning traditional male and female categories, switching to gender-neutral awards instead. 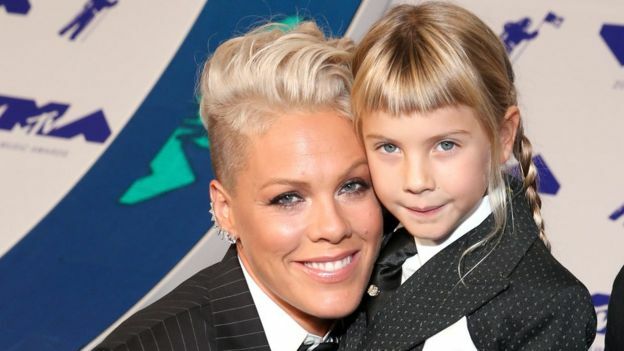 Pink won the Video Vanguard award and used her speech to give a message to her six-year-old daughter Willow, who turned up to the event with her mum in a matching suit. Pink said Willow told her she was “the ugliest girl I know” and looked like “a boy with long hair” – so the singer made a slideshow of “androgynous rock stars” like David Bowie and Prince. The 37-year-old singer told her daughter that stars like them “carry on and wave their flag and inspire the rest of us” and that she’d been criticised too for her looks. “So, baby girl, we don’t change, we take the gravel in the shell and we make a pearl and we help other people to change so that they can see more kinds of beauty,” she said. Kendrick Lamar’s opening performance had given a message about police brutality. And rapper Cardi B also touched on the issue when she gave a shout-out to NFL player Colin Kaepernick who has been sidelined after protesting against racial injustice by kneeling during the national anthem before games. “As long as you kneel with us, we’re gonna be standing for you,” she said.